Our planet is home to 1.8 billion young people today; the largest generation of youth in history. Growing up in an interconnected world, it is a generation facing many opportunities, but grave challenges at the very same time. This September, the UN will present a new strategy for youth to step up its efforts, working with and for young people around the globe. 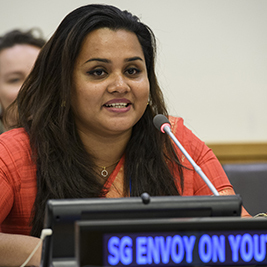 Ahead of the launch, UN DESA Voice talked to the UN Secretary-General’s Envoy on Youth, Ms. Jayathma Wickramanayake, who shared her hopes for what this new strategy will achieve. Today, our world is home to 1.8 billion young people; the largest youth generation in history. What are some of the major challenges that this generation is facing? This large youth generation also brings tremendous opportunities for the world. Can you tell us what this means for our global efforts to achieve the Sustainable Development Goals? In September, the UN will launch a new strategy for youth. How will this new strategy help young people around the world? What is it hoping to achieve? “The UN Youth Strategy offers an umbrella framework that will guide the entire UN system to work with and for young people, as we seek to step up our work to empower young people to realize their full potential and stand up for their rights at the global, regional and country level. The strategy further aims to significantly strengthen the UN-System’s capacity to meaningfully engage with young people, providing avenues for their participation and ensuring the system can benefit from their insights and ideas. Through this strategy we hope to facilitate increased impact and expanded global, regional and country-level action to address the needs, build the agency and advance the rights of young people around the world, and to ensure their engagement and participation in the implementation, review and follow-up of the 2030 Agenda for Sustainable Development as well as other relevant global agendas and frameworks. On the one hand, the Strategy has five priority areas that the UN aims to programmatically focus further on: engagement, participation and advocacy; access to quality education and health services; economic empowerment through decent work; youth and human rights and civic participation; and peace and resilience building. Here it is important to mention that the great thing is also, that existing key interagency initiatives on youth, such as Decent Jobs for Youth, the Compact on Young People in Humanitarian Action, and Youth, Peace and Security efforts, as well as forthcoming initiatives, such as the Generation Unlimited Partnership initiated by UNICEF, will be situated under the overarching umbrella of the Strategy. How has the strategy been developed? Have the voices of young people been included? “The Strategy was finalized under the leadership of my office in close coordination with the co-chairs of the Interagency Network on Youth Development and benefitting from the inputs of many of its members. We had twenty-seven UN agencies, funds, programmes and departments actively contributing their inputs to the strategy. Also, youth have been consulted throughout the process, in particular through the Major Group for Children and Youth (MGCY) and the International Coordination Meeting of Youth Organizations(ICMYO), who together represent through their networks thousands of youth organizations and millions of young people from all over the world. Now beyond the development of the Strategy itself, we will also count on our internal and external partners in the roll-out, implementation, monitoring and review of the Strategy going forward. When will the strategy be launched? How will young people be able to access the new strategy, and can they follow the launch event live? “On 22 June, the Secretary-General endorsed the strategy in his Executive Committee, and tasked my Office, along with the Department of Public Information to prepare for a launch initiative during the High-Level segment of the General Assembly. The event will take place on 24 September with the participation of the Secretary-General, Heads of Governments, Ministers, Heads of UN Agencies, CEOs of Private Sector organizations, foundations and civil society, and most importantly many young people. The strategy will be made available online. We are working to have it available in all 6 official languages of the UN. We hope to mobilize as many youth activists and advocates, youth organizations and networks, UN-System partners, Member States and others to galvanize attention, commitments and create momentum that will propel us forward as we start implementing the new strategy.